Twenty years ago, in 1991, Troy Davis was convicted of killing a police officer in Savannah, Ga. On Tuesday, Sept. 20, 2011, the Georgia board of pardons denied a bid to delay his execution, and state officials scheduled his death for the following day at 7 p.m.
On Wednesday, the U.S. Supreme Court granted Davis a temporary reprieve. The high court agreed at the last minute to reconsider the case and weighed arguments by Davis’s legal team and the state of Georgia over whether he deserved a stay. But the reprieve was brief. Davis was executed just after 11 p.m. Mark Rabil and Darryl Hunt believe Davis died an innocent man. 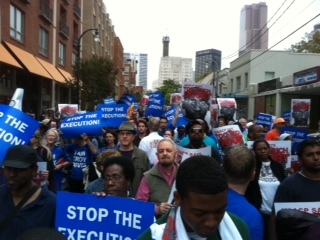 Troy Davis protest in Atlanta on Friday. Hunt and Rabil spoke during a news conference Tuesday at the Wake Forest University School of Law. Rabil was one of Hunt’s attorneys and is the director of the Wake Forest law school’s Innocence and Justice Clinic. Attending the press conference were students from the law school as well as undergraduates from WFU, UNC-Greensboro, Winston-Salem State University and North Carolina A&T University. A week before, some 100 people, including Hunt, Rabil, Wake Forest law students and alumni, boarded buses for Atlanta, where they marched and demonstrated in support of Davis. The case has gained international attention after Davis’s supporters raised concerns that he was a victim of mistaken identity. Several of the witnesses who helped convict Davis at his 1991 trial have backed off their testimony or recanted, the Associated Press reported, and others who did not testify say another man at the scene admitted to the shooting. “The rally and march on behalf of Troy Davis was a moving experience, and we were all very hopeful that this man’s life could be saved, “said Leslie Greening, a Wake Forest law student who joined the rally in Atlanta. Wake Forest law student Paul Derohannesian said the trip to Atlanta opened people’s eyes to other dimensions of the criminal justice system not usually seen or thought about. It brought to light, he said, the inherent challenges in making the criminal justice system live up to its ideals. “The experience, including being at Ebenezer Baptist Church, reminds me of Martin Luther King’s famous sentiment, ‘With this faith we will be able to hew out of the mountain of despair a stone of hope,’” Derohannesian said. In 1989, off-duty Savannah officer Mark MacPhail was shot and killed while trying help a homeless man who was being attacked. Prosecutors, according to the AP, say they have no doubt that they charged the right person with the crime, and MacPhail’s family lobbied the pardons board to reject Davis’s clemency appeal. Rabil said the Davis case is an example of the tragic tendency of courts to reject new evidence of innocence, even when compelling, simply to uphold the finality of court decisions. “In our clinic, I teach that there are many gateways to proving innocence, in addition to the traditional court avenues,” he said. “I believe that it was very educational for our students to experience a long bus ride to and from Atlanta, led by exoneree Darryl Hunt, and to march with thousands in support of a likely innocent man on death row.